If the Dauphin Island Sea Lab was a tree, Dr. Judy Stout’s presence could be detected from the innermost rings almost to the cambium. As a Ph.D. candidate from the University of Alabama in the late 60s, Dr. George Rounsefell hired her to assist him in writing a book that was published a year before his death in 1975. Her nearly completed doctoral dissertation was lost in the Point aux Pins fire during Christmas break of 1971. While writing her second dissertation, she assisted George Crozier in the direction of the Mississippi-Alabama Sea Grant Program until in 1972, Mississippi and Alabama created one of the few bistate Sea Grant programs. In 1977, having completed the second dissertation and becoming the leading expert on Gulf Coast emergent salt marshes, she developed the academic programs at the Sea Lab, successfully created the year-round activities that became the foundation of the Marine Environmental Science Consortium’s instructional programs, and served as Assistant Director for 22 years. Her consistently outstanding performance led to her selection as Assistant Vice President of Academic Affairs at the University of South Alabama, where she founded and directed the Honors Program and remained for seven years. She retired in 2005 as Acting Dean of the Graduate Program. 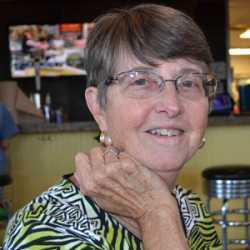 She served for seven and a half years on the Mobile County Public School Board, before stepping down and devoting even more time to her various volunteer endeavors, which include the Mobile Botanical Gardens, Mobile Master Gardeners, and the Mobile Area Education Foundation.